'Growing up in New York, I always wanted to be a Jewish cowboy," jokes Jeff Morgan, co-author, with wife, Jodie, of The Covenant Kitchen: Food and Wine for the New Jewish Table. To date, Jeff has included professional saxophonist (leading the band at the Grand Casino in Monaco, no less), shepherd (yes, really), wine writer and winemaker to his CV, but never cowboy. He got to dress the part, though, when they moved to California's Napa Valley to make wine. "Jews in California actually do wear cowboy boots and hats. My boots are real armadillo," he smiles. This is their seventh cookbook, and their first kosher one. "All of my best ideas are my wife's. About two years ago, we were walking in a vineyard near our home and she suggested we write the Covenant cookbook." Covenant is the winery in which they make multi-award-winning, world-class kosher wine. It was founded in 2003, after Jeff, who was at that time making non-kosher rosé, Solorosa, tasted great kosher wine and became convinced he could make fantastic kosher wine from Napa Valley grapes. He persuaded Lesley Rudd, founder of food emporium Dean and Deluca, of which Jeff had been wine director, to back him. Both men had been brought up on sweet and sticky Manischewitz - the US equivalent of Palwins kiddush wine. When pouring non-kosher wines at a synagogue fundraiser, Rudd asked Morgan why there weren't any great kosher wines. Rudd - worried in case the wine did not live up to expectation - would not let him use his grapes, but did back the project. Also fundamental was kosher winemaker and distributor Nathan Herzog, who at that time produced the only kosher wine in the region, and who had a shomer Shabbat crew. Jeff persuaded Herzog to allow him to share his team, whose morning and afternoon prayers around the fermentation tanks inspired Jeff to learn Hebrew. This set him on the path to celebrating a belated barmitzvah at the age of 44. Jeff is no earnest proselyte but is instead light-hearted in sharing his vision. "We're spreading the message that Jewish food is no longer only about bubba's recipes but can be eclectic and international." But don't expect rose-tinted visions of Jeff and Jodie's grandparents' culinary gems passed down on tattered bits of paper. "Our bubbas were not cooking much of anything. We're the classic US Jews from families who fought to shed their Jewish identity as soon as they got to the US," laughs Jeff, who explains that his father was so relieved to move on from his shopkeeping days on New York's Lower East Side, he never even told his children where the shop had been. "My family moved from London to Canada in 1830 and there was barely a shred of Yiddishkeit left. There is only one recipe, which I have taken from my grandmother, Alice Solomon - the gefilte quenelles, based on the dish she made from pike caught by my grandfather, Lester, from the lake outside their summer cabin in Wisconsin." Instead, the Morgans' cooking reflects time they have spent in both France and California - with its Mexican and Asian dishes - together with influences from Israel, where Jeff's daughter currently lives and where he hopes soon to make wine himself. "We were inspired to create dishes like gefilte quenelles, Korean flanchen, matzah ball fish soup and even shakshuka. Hence the new Jewish table," he smiles. He's particularly proud of their cowboy cholent, a rich heavy cholent inspired by an aromatic chilli made by Californian friend and fellow winemaker, Judge Scott Snowden. "It's fast becoming famous," he laughs. The cholent recipe precedes a section by OU Kosher, the US's highest licensing kashrut board, on how to prepare cholent for eating on Shabbat. "We involved the OU as it was important for us that we got it right so far as kosher is concerned." It is not just food but also wine that matters to them. Jeff's view is that most recipe book authors, particularly Jewish ones, know little about wine. "What we want to do is to present good recipes and to help the reader integrate fine wine into their daily dining experience, something which is not difficult. 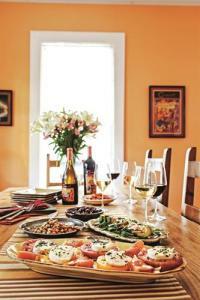 "For most of us, a glass of wine with dinner is going to make your day much more enjoyable." Jeff says his goal is to fight "wine paranoia", as he terms it. "People, not just Jews, drink wine only on special days or not at all. It's not hard to enjoy a glass with a bowl of pasta or a tuna fish sandwich. It shouldn't be daunting." The book gives a basic instruction on how kosher wine is made, and runs through all the basic wine varietals. Each recipe is followed by a wine pairing. Jeff believes that Jews are only now starting to revive an ancient tradition of winemaking. "We lost the traditions because we spent 2,000 years without land to grow grapes or we were in circumstances that didn't permit us to make wine. Now there are nearly 400 wineries in Israel making great wine and many more making kosher wine in Europe, the US, South America and South Africa. It can only get better." Copyright Â© 2015 Kedem Europe Ltd.